A 69-year-old female comes to the physician’s clinic for an annual flu shot. She was diagnosed with mild rheumatoid arthritis 3 years back and has been taking celecoxib and methotrexate to manage her condition. She also takes a daily folate-containing multivitamin. She has had 3 elective cesarean sections during her late twenties and had an appendectomy in her teens. Her family history is insignificant. She does not consume alcohol, smoke cigarette or take recreational drugs. Her physical examination is unremarkable. Since she is symptom free, she asks the physician if her medications can be discontinued. Which of the following test is most sensitive in monitoring her therapy? What is the next best step in the management of this patient? A 20-year-old woman presents to a physician following unprotected coitus with her boyfriend about 10 hours ago. She tells the doctor that although they usually use barrier method of contraception, this time they forgot. However, she does not wish to become pregnant. She also mentions that she is a known case of major depression and does not want to take an estrogen containing pill. After necessary counseling, the physician prescribes an enteric-coated pill containing 1.5 mg of levonorgestrel. Which of the following is the primary mechanism of action of this drug? A 44-year-old woman presents with palpitations and lightheadedness which she developed 3 days ago. It is the first time she has such an episode. Her blood pressure is 140/90 mm Hg, heart rate 150/min, respiratory rate 16/min, and temperature 36.6℃ (97.9℉). ECG demonstrates the picture. For cardioversion, it is decided to use an antiarrhythmic agent which has a use-dependent effect. Which of the following medications was most probably used? A 28-year-old man comes to his general practitioner for a regular checkup. He has recently been diagnosed with asthma and was given short acting β2-agonists to use in case of need. He said he usually uses the medication 1–2 times per week. Which of the following is the most appropriate treatment in this case? A 7-year-old girl is referred to the hematology clinic by her pediatrician. She has had low-grade fever for a week but a source of infection could not be detected. The child also complained of leg pain for a couple of weeks. The mother also noticed increasing lethargy and easy fatigability but attributed it to longer school hours as she has started 1st grade recently. The girl was born at term by a normal vaginal delivery and was healthy previously. Physical examination is significant for pallor and cervical lymphadenopathy. Further investigations including bone marrow aspiration and cytology confirms the diagnosis of acute lymphoblastic leukemia (ALL). The patient is started on a chemotherapy regimen consisting of vincristine, daunorubicin, L-asparginase and prednisolone for induction followed by intrathecal methotrexate for maintenance. Following the 4th cycle of chemotherapy, she develops bilateral ptosis. Physical examination shows normal pupillary reflex and eye movement. She is started on pyridoxine and pyridostigmine and in 7 days she has complete resolution of the ptosis. Which of the following drugs is most likely associated with this adverse reaction? A student studying pharmacology is a member of a team that is conducting a research related to elimination of anticoagulant medications. His duty as a member of the team is to collect serum samples of the subjects every 4 hours and send them for analysis of serum drug levels. He is also supposed to collect, document and analyze the data. For one of the subjects, he notices that the subject is eliminating 0.5 mg of the drug every 4 hours. Which of the following anticoagulants is most likely consumed by the subject? 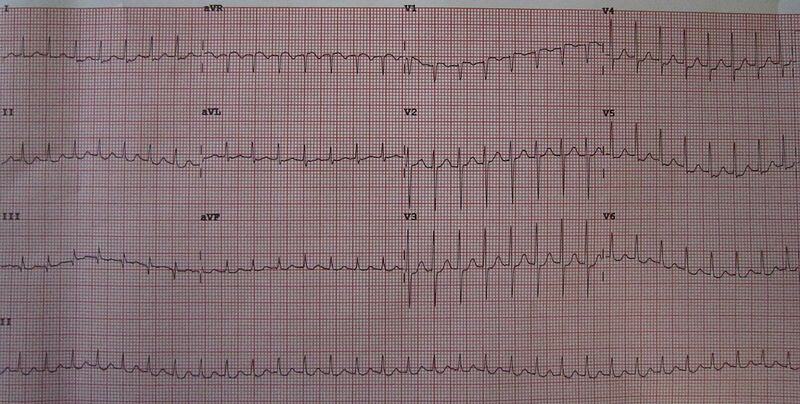 A 49-year-old man visits an urgent care clinic with the complaint of palpitations for the past few hours. He denies any chest pain, breathlessness or sweating. He is anxious and looks worried. Past medical history is irrelevant except for a mild bronchial asthma. He only uses medications during an asthma attack and hasn’t used it since last week. He is an ex-smoker and drinks a couple of beer on weekends. His vitals are heart rate: 146/min, respiratory rate 16/min, temperature 37.6°C (99.68°F) and blood pressure: 120/80 mm Hg. His physical examination is unremarkable. An immediate electrocardiogram is ordered. Which of the following group of drugs should be given to treat his presenting symptom? A 26-year-old previously healthy woman is presented with lightheadedness, palpitations, and sweating which started suddenly after she was frightened by her neighbour’s dog. The patient’s blood pressure is 135/80 mm Hg, heart rate is 150/min, respiratory rate is 15/min, and temperature is 36.6 ℃ (97.9℉). Her ECG is shown in the exhibit. What is the most preferred agent for pharmacological management of this condition? A 28-year-old male presents to the physician with fever associated with chills and malaise which began five days ago. He also mentions that the back of his right upper arm feels itchy. He is a forest guide and recently came back from a forest expedition. Upon asking, he reports that the forest he works in is infested with ticks. On physical examination, his temperature is 38.3 ºC (100.9 ºF), pulse is 87/min, respirations are 15/min and blood pressure is 122/90 mm Hg. 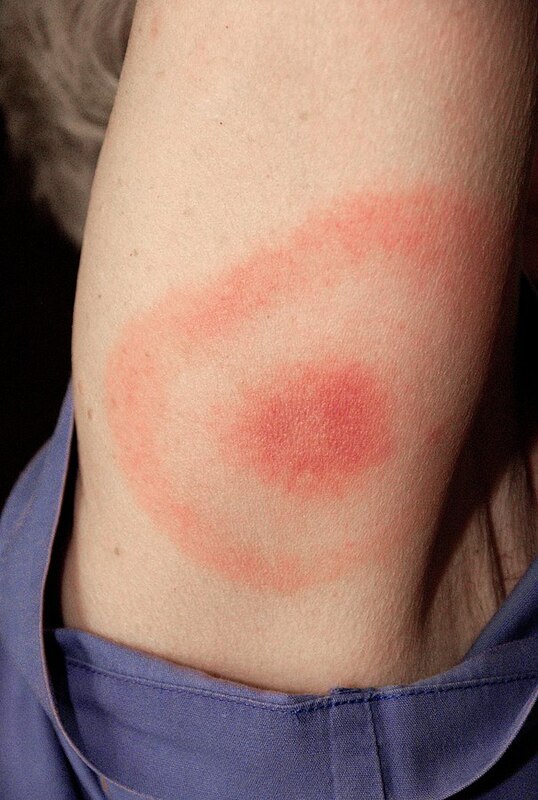 A rash is present on the posterior aspect of his upper arm which is shown in the picture. Which of the following is the drug of choice for this patient?